I love rifle length systems, though they have their place. Certainly clearing phone booths is not a 20s fortay… but that long tube as some major advantages to it and you should capitalize on those strengths. How so? So if we are going to upgrade a 20, what upgrades compliment it graciously? Effectively even? Velocity is a important factor in hitting a small target at unknown distances. While carbines get shorter and shorter with heavier ammo, I would like to remind rifle shooters that the 55 grain 20 inch barrel screams bullets down range with a very flat trajectory inside of 400 yards. We can keep shooting M193, or we can roll our own pills. One such loading I have been looking at is the Barnes Tipped TSX lead free 55 grain projectile. This bullet has a ballistic coefficient of .27 compared to .25 from the M193. On top of that, it is a reliable expanding projectile that doesn’t rely on fragmentation for its wounding mechanism. Shooting the Barnes TTSX is something that interests me greatly, and I believe I can push it pretty hard with a fast burning powder such as Accurate 2230. Sighting this projectile in at 100 yards two inches high will give me a maximum point blank range of 312 yards with a 3 inch rise above line of sight and 3 inches below line of sight and hopefully with more accuracy than M193. It looks like the perfect choice for people who prefer a defensive / shtf bullet that shoots as flat as M193 and should be a great option for barrels 16 inches and up. I realize lately I have been talking about reloads often. I will be creating the *ultimate guide* to apartment reloading here in the next few months. Typically when I write a guide, I go all out and spend considerable time on it and there wont be any new posts for a few weeks. It is important to me to get people reloading so they can add another layer to their shooting, and I realize many AR15 aficionados don’t have a workbench. This guide will take care of you, and give you a safe intro to reloading, with powder recommendations that wont blow you up. So what other upgrades will benefit a 20? I recently purchased a M4SD compensator from Griffin Armament. The nice thing about compensating a 20 is that the pressure and concussion are greatly reduced compared to SBR’s. We also have a more complete powder burn out of the 20 and thus (theoretically) less muzzle flash. 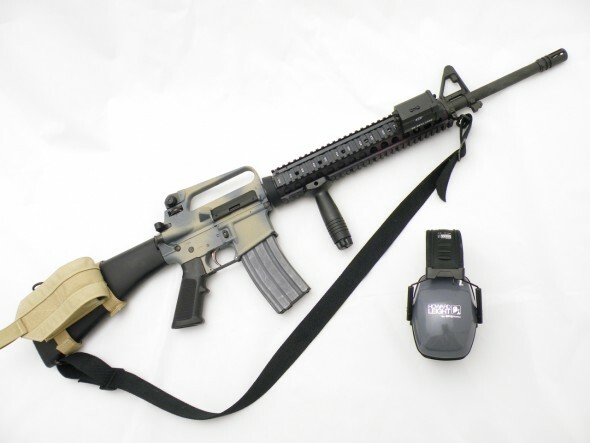 Griffin Armament makes a comp which is the same dimensions as the A2 flash hider, the M4SD-II. Adding a compensator to a 20 gives you a good return for your investment; it will offer less concussion than shorter carbines, a high degree of control, and lessens the recoil even more for rapid follow up shots. The last time I shot my 20 with a compensator with 60 grain reloads, after the first shot I function checked my rifle as I thought it was broken. It kicked so little, that I thought I had a malfunction. Nope, the Cav-Comp I was using mitigated what little recoil the gun and load had. Why Do I Keep Hearing About 20 inch Reliability? Bad magazines: Poorly made magazines or older magazines with weak springs? Old generation follower? Possible failures to feed. Your bullets are going to get pushed low into the feed ramps before they are pointing up towards the ramps / chamber, worse yet if you use heavier grained ammo with old magazines and old followers. Overgassed: Another common AR15 problem: bolt velocity is greatly increased and this can cause the bolt to bounce foreward off the receiver extension and it may try to feed a round before the magazine has time to push the round to the top of the feed lips. Possible double feeds or failure to feeds. Buffer weight too low for the gun? Again bolt velocity is increased and your buffer / carrier could possibly be too fast for the magazine. Magazines are an integral part of AR15 reliability: Strong springs and better followers have dramatically improved carbine reliability. In the “older” days, a worn USGI magazine with a weak spring and a black or green follower could lag behind the speed of the bolt attempting to chamber the round. A quick fix for that? “Extended” M4 feedramps. Largely a non-issue with today’s quality magazines and followers. So you can see why some carbine owners experience trouble… if the gun cycles too fast, you can get failures to feed. If the magazine can’t keep up, then failures to feed. Modern, quality magazines have made carbines much more reliable, provided they are manufactured correctly. The reason the 20 inch guns have always been favored for their reliability in the past is that they were typically equipped with a rifle weight buffer, delivered the appropriate volume of gas at the right time to the bolt assembly (as it was designed), and the bolt cycled to the rear at the appropriate velocity and it gave magazines – even old USGI magazines with black followers and tired springs from the 80’s – a good amount of time to push the round up to the top of the feed-lips before it tried to chamber the round. In the last ten years since the sunset of the assault weapon ban, we have largely solved the carbine issues in the civilian market due to increasing use of the H2 buffer weight, and the high availability of brand spanking new, quality made magazines with superior anti-tilt followers. Today, carbine reliability issues are very much solved… but that doesn’t mean every manufacturer drills the gas port to the proper size, or equips the rifle with the proper buffer weight, and that doesn’t mean there aren’t crap magazines out there. A newbie will not know these things and he wonders why his gun is running like crap. I will say that modern carbines are every bit as reliable as a rifle so long as they are built to a standard of quality. So does the 20 inch vs carbine reliability matter today? Honestly, *not as much*, but if you want that theoretical maximum reliability and long parts life, then the 20 inch gun will be a superior platform. I don’t think the 20 is dead. It’s seeing a bit of a resurgence, but it is still second fiddle to carbines. Take advantage of this and build a “long gun” for cheap, especially if you don’t mind A2 receivers. A high reliability, soft shooting, flat trajectory rifle that is also dirt cheap? Yes please. I have a 20″A2 Ar15 with the traditional round rifle length fore grip.The gun has iron sights.Curious to know how you like the vertical grip you have on yours and who makes the extra mag holder.Mine has a Shilen heavy barrel. The verticle grip is fine, but the KAC rail added just for the grip feels like overkill. If you are running HBAR adding something like the old KAC rail might be a weighty beast. Extra mag pouch is brand unknown but you can find them by searching for buttstock magazine pouch. Good post! I do love me some 20″, more and more I’m thinking of it as my “go to” for most things. They are great, “no drama” rifles and a pleasure to shoot. Looking into the TTSX rounds, I’m quite intrigued by the 62gr versions. Two things about shooting the 55’s…they will lose their velocity a little faster than heavier bullets, and the wind loves to do bad things to them much beyond 200. On the other hand, if you are a serious shooter you’ll learn to be an excellent wind doper. Excellent blog by the way. Just started rooting around in here a bit. I’m not a modern AR guy (I like the wooden stocks I learned on 40 years ago) but I think you’re pretty much on the right track. Get a few more highpower matches under your belt if you can. I too employ the 20″ inch goodness of a gov’t. profile Colt. Love it. I know this is an old thread, but my coyote rifle is built with a free floated 20 inch BCM gov. profile barrel. Its an honest sub minute shooter. from a bench with a bipod it will put ten shots on a 1 inch square with my 77 grain hand load. (yep a chrome lined barrel that shoots inside a 1 moa) its my favorite rifle. I have a question I cant find the answer to I have a 16″ barrel on my Colt AR15 with a 16″ Nato barrel. I also have a 20″ Nato barrel. My question is can I take the hand guard off the 16″ and mount it to the 20″ barrel. Reason I have all accessories mounted on it and would hate to buy a new rail for the 20″ barrel if I can transfer from one to the other.